This capital of the Tang Dynasty was a city of about a million people, laid out according to cosmological planning principles. 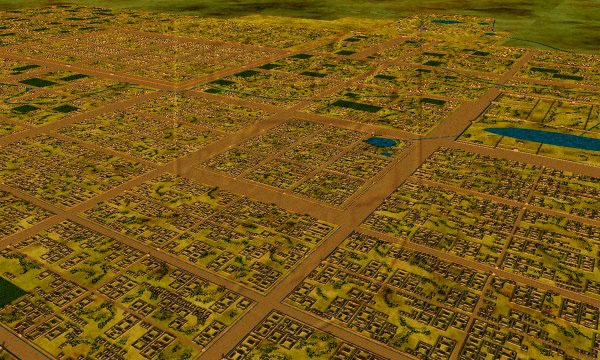 The layout of 8th century Chang'an is similar to the diagram for an ideal city known as the Wang Cheng found in the 2nd century book of rites known as the Zhou-li. The theory of the Chinese city is rooted in this system and undergoes little variation during 2000 years of urbanization. Chang'an is oriented to the cardinal points, north-south and enclosed by an orthogonal double set of walls, with three sets of gates on each side. 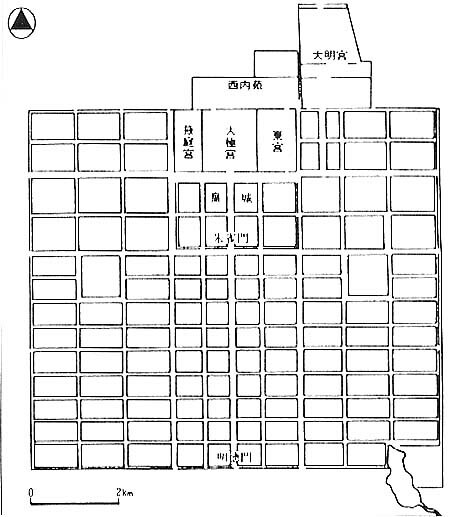 It is divided into a checkerboard grid, each block reserved for one of the 108 wards (called "fang"), which would have had as many as 10,000 inhabitants in each. The ward is enclosed in its own walls with gates that were closed every night. These wards were organized according to geographic provenance and ethnicity--Chang'an was a multi- ethnic, multi-lingual, multi-religious center--there were even Christian churches here. Chang’an was a large city, with the outer walls stretching 9.5 kilometers (6 miles) long along the east-west axis and 8.4 kilometers along the north-south axis. The central street was reported to be 160 meters (480 feet) wide and led to the palace complex in the north which of course was walled off and accessible only courtiers. Three major east-west streets crossed three major north south streets, each of them about 300 feet wide, and each of the major streets led to a city gate. Slightly different than the Wang-Cheng diagram, the palace was placed on the north rather than in the center. The ancestors Hall, the principal shrine for the city, was placed in the east and the altar of land and grain on the west. The two city market places for weekly markets were also on the east and west. The word for city in Chinese is "cheng" which also means ”wall”. The city was indeed surounded by an outer wall: during Tang, the main exterior walls of Chang'an rose 5 meters high. But there is also a wall for the Emperor’s palace. Then each neighborhood in turn was contained in a walled ward. Finally there were walls surrounding the traditional courtyard house itself. The Chinese ancient city was planned like a series of Chinese boxes with walls within walls, within walls. The walls of Chang’an and its auspicious name did not prevent its demise (yet again) about 1000 years ago. But a new city, Xi’an is standing now over the old.